Danny Goodman was a marketing genius who's ideas were way before his time. He started as a 14 year old hot dog vendor at a minor league ballpark in Milwaukee Wisconsin. He died 57 year later known as the greatest baseball paraphernalia salesman in the history of the game. Danny Goodman was quite a personality, and a man that knew how to sell. You name the trinket, he’d stamp a Dodgers logo on it and sell thousands of them. When opportunity knocked, Goodman would cash in with the best of them. 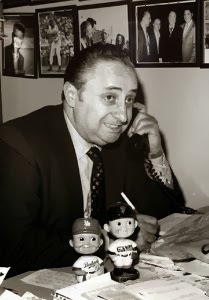 And if you ever wondered who it was that introduced the bobblehead doll to the U.S. market, look at none other than Danny Goodman, who brought the idea to the states over from Japan long before the Dodgers ever played an off-season series there. He was a man with a thousand ideas and he never stopped them coming up until his death in 1983. On top of his Dodger Stadium desk sat a marble plaque with the words inscribed “A cluttered desk is a sign of genius,” and the words were the absolute truth in his case. Goodman claims that he was the person that first sold team caps in the ballpark, long before he was ever with the Dodgers and most likely in his days selling memorabilia in the 30s at Detroit. Who is here to refute the claim? Goodman was certainly around at the time. He also was knee deep in controversy in 1934 during the World Series, as the pies Goodman was peddling in the stands at Briggs Stadium were being thrown at Cardinals outfielder Joe Medwick, who had slid hard into Marv Owen, the Tigers third baseman. Things got so bad that Commissioner Kennesaw Mountain Landis ordered Goodman to stop selling the confectionary ammunition. So his life story began in Milwaukee where Danny, the son of Ukranian-Jewish immigrants, lost his father at a young age and had to support his mother and siblings. He had the gift of gab and persuasion/ After much persistence, he convinced the Jacobs Brothers concession company that he could sell hot dogs, peanuts and candy at minor league games. He proved to be a top salesman immediately and within a few years Goodman was in a managerial position and administering to the concession company's needs in several markets simultaneously. By the mid 30s Goodman had worked his way up the chain with Jacobs Brothers to manage the company’s concession business at various entertainment venues that included circuses, burlesque houses, theatres and major and minor league fields spanning to Chicago, Detroit, Baltimore, and Pittsburgh. By the late 30s, Jacobs offered him a position in Los Angeles where he managed concessions sales in the entire Pacific Coast and Pioneer Leagues stretching from California to Washington state where he served in the position as Concessions Manager and Advertising Director. He started the Hollywood Stars celebrity game with the PCL Hollywood Stars team at Gilmore Field, a tradition that continues to this day with the Dodgers. He hob-nobbed with actors and actresses and had them pose in photos with his memorabilia that he would easily sell with free advertising from a movie stars appeal. Gary Cooper, Barbara Stanwyck, Bing Crosby, Jayne Mansfield, George Burns, Lucille Ball, Bob Hope, Milton Berle, Cecil B. DeMille and George Raft were regulars at the stadium and Goodman would cater to their every need. 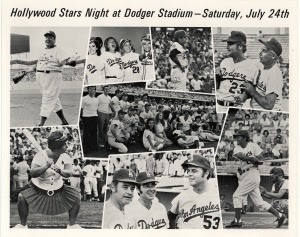 Hollywood stars game was originated by Goodman back in the 1940s. In these Dodger Stadium photos are inlcuded such actors as Jackie Gleason, Jack Lemmon and Dean Martin. An early riser that was engaged in the entertainment industry heavily. Goodman served as the Friars Club entertainment chairman in Beverly Hills from the mid 40s through the arrival of the Dodgers in Los Angeles in 1958. At that time, his emplyment was rather tenouous as Walter O’Malley was bringing his administration from Brooklyn to Los Angeles and the PCL was a dying league. But Bob Hunter of the Los Angeles Examiner put him and Walter O’Malley in contact and Goodman in the course of a phone conversation was hired on the spot by the Dodger owner. He was that persuasive and amiable. O’Malley later told Hunter, “That was a great thing you did that day.” Goodman would make O'Malley millions of dollars over the next few decades, and in the course of that, the Dodger brand was marketed world-wide. There are baseball traditions that exist today because of Goodman. Did you ever wonder why grounds crews drag the infield in the middle of games? It was Goodman who ordered it at Hollywood Stars games to slow down the action of games going too quickly. This would allow concession sales to increase during respites in the action. Other items that were introduced by Goodman. 1) Insistence that food at ballparks be on par with restaurants. While with the Hollywood Stars, his hot dogs and hamburgers were of top notch quality and recognized as such. 2) The first team to wear shorts as their official uniform. (Hollywood Stars, 1950). 3) The bobblehead doll at Gilmore Field, a chubby player with rotund cheeks and a smile. He had no idea that they’d catch on as they have in the past 20 years, but by the 60s, all major league teams had designs of the dolls with their uniforms. 4) Using celebrities to fill the stadium. Goodman utilized his Hollywood connections to successfully market the teams he worked for. It was Walter O’Malley that said “If half his friends show up, we’ll sell out every game.” Goodman was roasted at a celebrity dinner by Ronald Reagan and Jack Benny years before the Dodgers ever arrived in Los Angeles. Goodman, was a king of malaprops, much as Yogi Berra was. It was reported that when asked if he could get Hollywood celebrities to show up for a game, he said, "I'll give you stars you've never heard of." 5) The establishment of permanent novelty stands at ballparks. Goodman predicted that one day Major League Ballparks would have active retail stores within stadiums to sell concessions. This was 40 years before it actually would happen. 6) Mail Order concessions. Goodman organized this multi-million dollar enterprise that became MLBs model that continues to this day. 7) Goodman was the first to persuade department stores to carry Dodger merchandise and apparel. This started in 1959 with Sears and Roebuck. 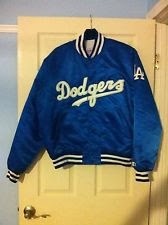 Danny Goodman provided replica Dodger satin jackets for sale. A very popular item among Dodger fans. In Goodman’s first year with the Dodgers, concession sales by the Dodgers alone surpassed every other team in the league combined. And that was from sales at the ballpark alone. Piggy banks, ties, scarves, dozens of different types of hats, pajamas, pillow cases, cigarette lighters, key chains, jackets, bracelets, bandannas, binoculars, airplane models of the Dodger plane, money clips. Wallets, purses, Pins, dolls, plastic bugles, and assorted types of bats, balls and helmets. You name the item. If Goodman could put a Dodger logo on it or an interlocking L.A. on it, it would be for sale. With the Dodgers playing three World Series games at the Coliseum in 1959, Goodman was aware that the sun would burst through and hit 90,000 plus fans in the face at a certain time of day and no shade would be present to protect them. He was ready to sell Dodger logo straw hats at just the right time. Over 160,000 were snatched up by fans at $2 a piece. That was $320,000 in sales, a hefty chunk of change in those days. As a kid, I became familiar with Goodman through Dodger promotions that would be advertised during games. It was every kids dream for their parents to shell out the $10 or $12 bucks to buy those trinkets that included a t-shirt, cap, ball with the logo and cards. We all wanted his stuff. Those desires continue today, as Goodman's trinkets sell on eBay for substantial prices because they bring back our childhood memories. A time when the game was much more innocent and we would walk into the Coliseum or a fresh new Dodger Stadium and let the game sink into our senses full force. Often times those memories we'd take home with us via a Danny Goodman souvenir item. Those memories continue today, with the tangible artifact that we bought so long ago. Thanks to Danny for that. He was truly a baseball pioneer and perhaps worthy of Hall of Fame recognition for that. It’s Super Bowl week and that means one thing to me: Pitchers and catchers will be reporting to spring training in 6 days. Position players in 11 days and in 24 days the first exhibition game will be played. Football season to me is just a sport that's played during the dog days of winter when the days are short and the nights and cold. I suppose there has to be a respite from the baseball season and I guess the good Lord gave us winter because of that, but he also gave us Arizona and Florida to overcome those winters too. 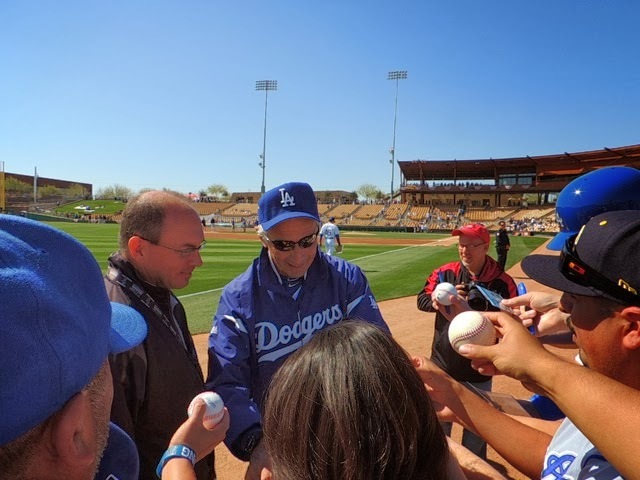 In the Dodger blogosphere, message boards and Twitter, I see more and more reminders that the season is just around the corner as fan fest is occurring this Saturday. Dodger fans are just warming up for baseball nirvana from March through October. 2014 looks to be one of the most promising seasons to look forward to in years.So let me just address a topic that is near and dear to my heart: spring training. I’ve attended spring training games in Florida and Arizona ten times now over the past eighteen years. I think I’ve come to understand the importance the Dodger organization has placed on providing their fans with an unforgettable and positive experience each late February and into March. Allowing fans access to the players is an important part of that. It is a Dodger tradition. It is something the other organizations in baseball don’t allow. It is one of the reasons that baseball fans should be Dodger fans, because no other organization cares this much about their fans. I think it’s fantastic and something that sets the Dodgers apart from other organizations. Take a look at Camelback Ranch (CBR) itself and compare the two teams that share the complex. The White Sox players and coaches are completely segregated from their fans. Their practice fields have no fan access to them. Their players do not walk from their clubhouse to the fields through the fans. The only way a White Sox fan will have access to talk to or interact with White Sox players is inside the stadium before the game. That’s it. Andre Ethier taking time to sign and chat with fans. The Dodgers, on the other hand, have allowed fan access to the players practice fields since 1948. The players walk through the fans to get to the fields. The minor league fields are completely open to the public for fans to watch from the early mornings to the afternoons. 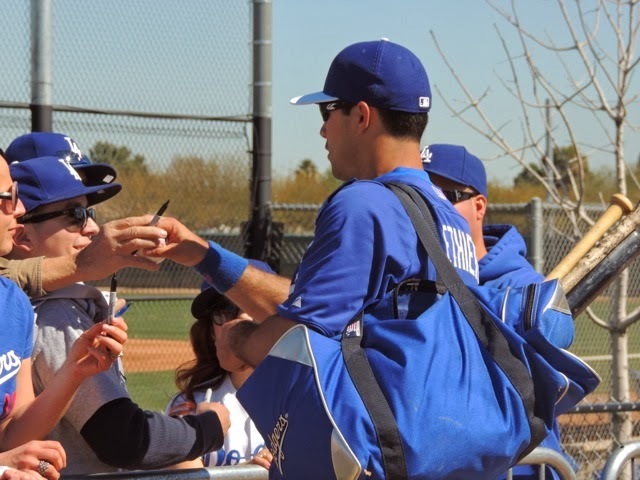 Several Dodger players take the time to sign autographs and talk to their fans on a daily basis. 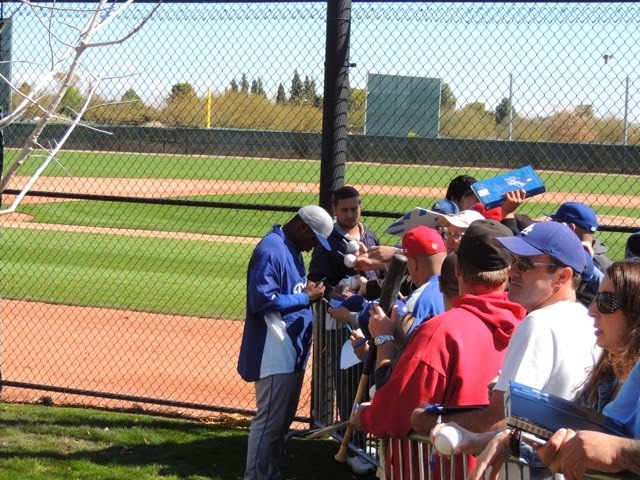 Yasiel Puig was a frequent signer last year, accommodating fans from the day he arrived. CBR is an ideal spot for the casual autograph collector to go and simply clean up. There’s the Mattingly pole, where Don retreats to every day to sign for those that line up for a signature or a photo. There is the parking lot egress point where players come and go throughout the day, with many stopping and accommodating waiting autograph seekers. There are the former players that often are at the minor league fields that are happy to talk with fans and allow them to watch the goings-on without interruption. 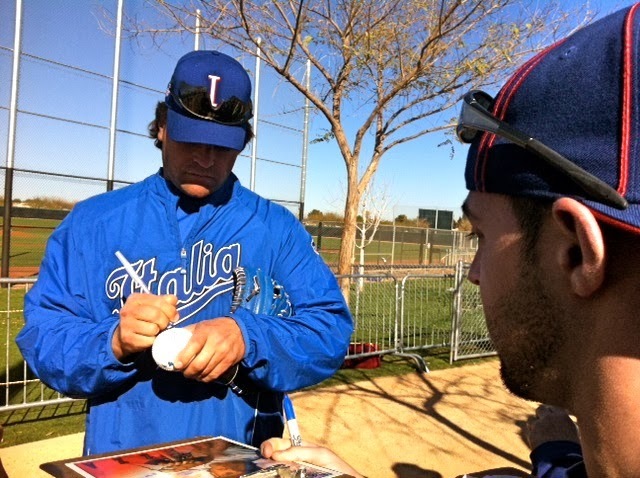 Even Mike Piazza, an Italian team coach, stopped and signed last year. He came through during the Dodger game, so there weren't a lot of fans around. And there's Tommy Lasorda. With Lasorda there's a recent development over the past few seasons that everyone seeking to interact with him needs to be aware of. 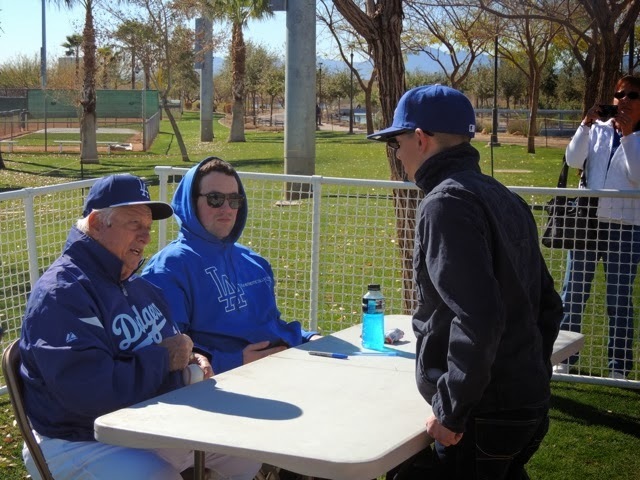 The Lasorda table is set up daily, complete with a security person. A line forms each day for the Hall of Fame manager to sign for the fans. We joke now that it's becoming more and more like the "Soup Nazi" character scene from the Seinfeld show. Now I mention that in jest because we have all come to know and love Tommy, but as he has gotten older, he’s become insistent that fans requesting his autograph remain polite and use proper decorum. There is respect that he demands from everyone. 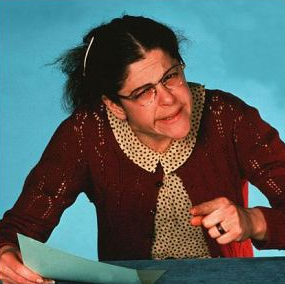 Otherwise, "No autograph for you." Don’t ever call him Tommy. It is "Sir" or “Mr. Lasorda,” and it always will be. The man is 86 years old now. Give him some respect. You better say “please” when making a request. Failure to do so will result in an admonition from the man. Just one item for signature. You could push your luck with two items, but you’ll risk a tongue lashing, so I say, it’s not worth it. Keep you stories quick and to the point, the line is long and Tommy will remind you that he can barely remember what he had for breakfast, so don’t expect him to remember when you briefly met him 27 years ago. A “thank you, sir,” better be said after he obliges your autograph request, otherwise he’ll remind you of that. And that’s for little kids too. Little kids that are probably wondering why their parents have lined them up to have this chubby grumpy old man in a uniform sign a ball for them. My seats for this game were down the first base line in the front row. When Koufax walked in, a stampede ensued. All of these people moved in front of our seats to get autographs. Last season a disturbing development occurred with autograph seekers as adults from the memorabilia industry converged upon CBR after Sandy Koufax arrived to work with the pitchers. It was an ugly scene and it forced the Dodgers to replace the ropes with metal barricades to keep fans in their place. There were literally people being trampled as some of these autograph seeks attempted to get near the Dodger legend. Sandy, an extremely private person, doesn’t like the fuss and I seriously wonder if he’ll return again without some assurances that he won’t get some security for his own protection and those of the fans as well. I personally witnessed a professional autograph seeker hand a twenty dollar bill to a little girl that he was using to get Koufax's signature. The Koufax autograph is about as rare a find that there is in the baseball world. Rare finds equate to huge dollars for a Koufax signature, and that isn’t a good thing for a lot of fans. But truth of the matter is that things got quite disturbing. If last season’s experience is a telling factor, Sandy just might not be back without drastic changes being put in place, and that is really unfortunate. 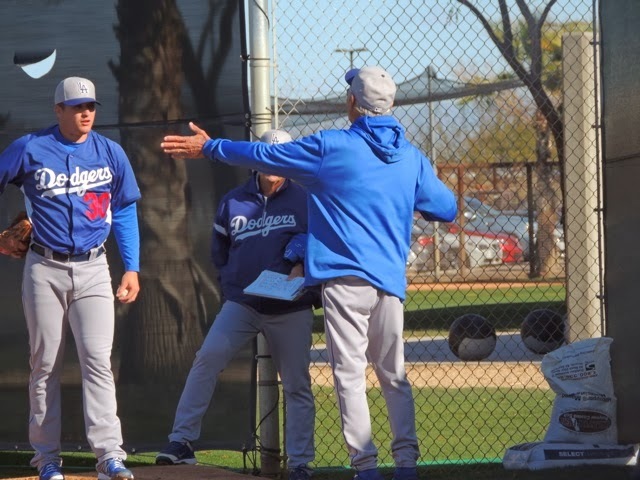 We saw Koufax arrive in February last year, before exhibition games had even started and he played a big role in working with all the pitchers. It was a wonderful thing to see too, the 78 year old hall of famer working with prospect after prospect with one on one mound sessions. For the second year in a row, the Dodgers will begin spring training very early this time around. Pitchers and catchers arrive on February 8th. Last year all teams started early due to the World Baseball Classic interruption. This year it is because of the Australia series in mid-March. Both the D-Backs and Dodgers have been permitted to start earlier than other teams. The first exhibition game will be on March 26th. The Dodger's Cactus League schedule will wrap up by Sunday, March 16th as the season opener in Sydney is on March 22nd. I know we're still in January, but once the players start congregating in Arizona, the season seems just to be around the corner. Within two weeks the talk of the town will be the Dodgers again, and that's always a good thing. Trayvon Robinson is Back, But Where Is There Room For Him? The Dodgers signed Trayvon Robinson to a minor league deal yesterday and I have to say, I’m surprised. I’d like to say pleasantly surprised, but at this point, Robinson’s status as a prospect as questionable. I think he’s destined for a season in Albuquerque and we already know he can play there, but is he good enough to excel at the major league level? The jury is still out on that question. What is it that happened to Robinson? 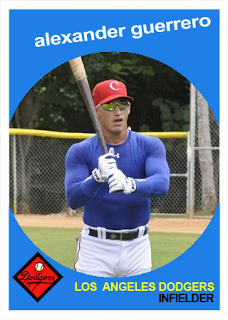 Touted as a top prospect from the Dodger farm system, he was a local boy that many were eager to see make the Dodger major league roster. From 2009 to 2011, he was putting up respectable and advancing numbers at Inland Empire, Chattanooga and Albuquerque. Always a fine defensive outfielder (with a below average arm). A corner spot looked like a good place for him. By then his power numbers were inching up, and he always had a good OBP in the .374-.400 range. There seemed to be a lot of promise in the young prospect. Then July 31, 2011 arrived. The trade deadline that to this day confused many of us. A 48-59 Dodger team entered the trade deadline 12.5 games out of first place. They traded Robinson away in a seven player/three team deal that landed them Tim Federowicz, Juan Rodriguez and Stephen Fife from Boston. It is fair to say that most knowledgeable Dodger fans hated the deal. Writer’s in baseball circles were confused too. Dodger G.M. Ned Colletti summed up the deal real simply by saying “we need catching and it’s easier to find an outfielder than it is a catcher.” Two and a half years later, the move looks to be an astute one for Colletti as both Fedex and Fife have had some fine moments as Dodgers. So Robinson was gone. 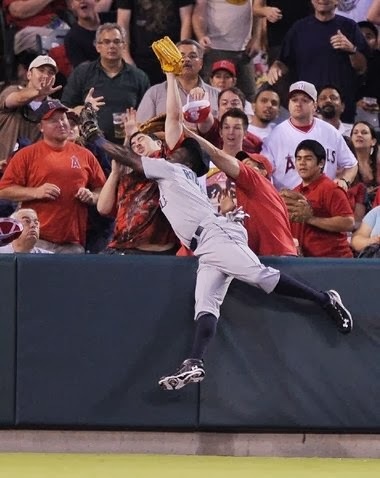 And seven days later while making his major league debut for the M’s in Anaheim, he made a highlight reel catch jumping into the left field stands to rob Torii Hunter of a homer. It looked like he was on his way to a major league career. Unfortunatley for Robinson, he could never find consistency on the big league stage. He bounced between Seattle and Tacoma in 2011 and 2012. Then in 2013 the Mainers dealt him to Baltimore and it looked like he’d get a shot there. 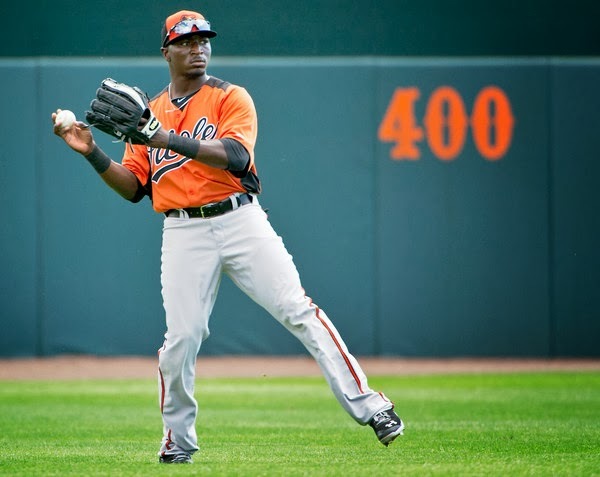 “We like him,” said O’s manager Buck Showalter during 2013 spring training. “He’s going to get an opportunity here to show what he can do. Switch hitting guys who can play three spots are hard to find, and especially at his age. He’s still a young man.” It was probably his youth that made the decision easy for the Orioles to send him back down to the minors. And things went down from there, as he failed to produce at AAA Norfolk and eventually was demoted down to AA Bowie. At season’s end, the Oriole organization cut Trayvon loose. In 107 minor league games last year, Robinson’s stat line was .247/.329/.394. Now 26 years old, he returns to the Dodger organization where there is little room to break in as the Dodger fifth outfielder where such players as Joc Pederson, Scott Van Slyke, Nick Buss, Mike Baxter and even newcomer Jeremy Hazelbaker are vying for the spot. Remember that the Dodgers already have a glut of four star studded outfielders to cover the three starting spots. Rumors were bandied about the blogosphere that the Padres were interested in signing Robinson to a minor league deal, so it was quite a surprise to see that he agreed to a minor league deal with the Dodgers. Perhaps it was his familiarity with the organization that won out. There is no measurement to his desire to break in with the team he grew up rooting for but he really has an uphill battle ahead. We’ve all read the news. Tanaka is a Yankee and that’s not too surprising considering the sorry state of the Yankee starting pitching staff combined with the freed up money from the ARod suspension. There was a lot of talk that the Yankees were in a cost-cutting mode to get below the luxury tax threshold, but truth is, they’re still up top as the most free spending club in baseball. That’s a label that is tough to keep, especially when you consider the deep-pocketed Dodgers, but I have a sneaking suspicion that the team in the Bronx will always be a top the board as the biggest spenders on player payroll. First, because of their massive television and advertising money and second, because they are located in the heart of the largest market in the nation. Add to that their world recognized brand and you have the makings of a baseball club that will always be able to spend freely. $175 million to Tanaka is about $55 million more than what many expected to be paid. The Yankees have proven over the years that they can buy championships. More often than not, they fall short of that, but they’ll always be amongst the top tier of teams in the standings. That’s the Yankee way and it has been that way since the 1920s with a few down periods now and then. Former Dodger Hiroki Kuroda is Tanaka's new teammate. Now they are quickly becoming the team that represents the land of the rising sun with Ichiro, Kuroda and Tanaka being marquee players. 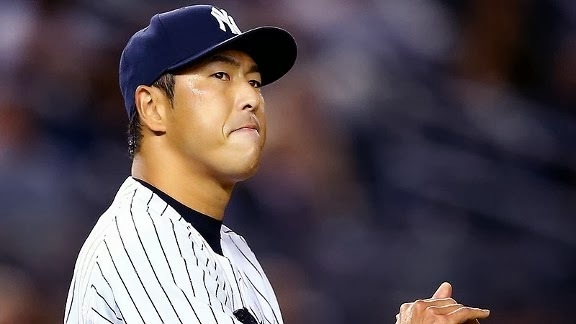 The Yankee starting rotation is 40% Japanese. Deep down, I’m thinking that the fact that Kuroda and Ichiro are on board in the Bronx, that might have influenced Tanaka's decision to head to the big apple. That’s total speculation on my part, but that certainly had to help. So, what are we to expect from the Dodgers for the remainder of the off-season? 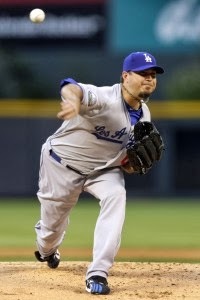 Rumors abound that they may sign Bronson Arroyo or maybe even Matt Garza. Now the David Price trade rumors are starting up again too. I’m of the opinion that they simply need to stand pat and enter spring training with Josh Beckett and Dan Haren in the number four and five spots. There will be Chad Billingsley in the wings when he returns from Tommy John surgery, (and his agent Dave Stewart is predicting a return in May). Stephen Fife remains in play too. Los Angeles should have other pressing matters to deal with immediately and those will be settling prior to arbitration hearings with Kenley Jansen and A.J. Ellis and a Hanley Ramirez contract extension as well. Settling all of these roster slots and making eveyone happy should provide for a positive clubhouse. What remains to be of number one priority will be to for the ball club to enter the season injury-free. 2013 proved to be one of the most injury plagued Dodger seasons in years, yet they still came within two games of the fall classic. With a little more luck on the health front, this ball club should fare much better in the standings. Players to watch this spring will be Beckett and Fife from the pitching rotation, as they both fell upon physical ailments that sidelined them. Add to that the recoveries of Chad Billingsley and Scott Elbert, both due back around mid-season. Watch for Matt Kemp as he returns from foot and shoulder procedures that are serious enough that his agent is saying that it’s doubtful he’ll be ready for the mid-March opener in Australia. We haven't heard a word about Hanley Ramirez and his broken rib, so I take that to mean he has probably healed up, but it'll be interesting to see him swing that bat in March. Last but not least will be newcomer Alexander Guerrero who has been hobbled with a strained hamstring all winter. It probably surfaced due to his many months of baseball inactivity. 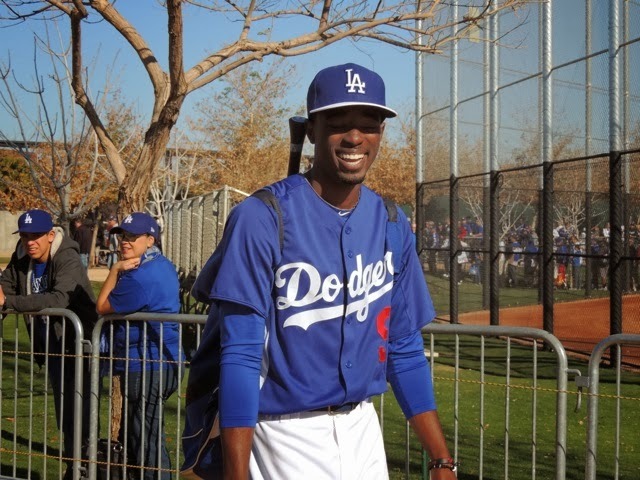 It'll be interesting to see of Guerrero is ready for the big leagues, as expectations may be a bit too lofty for him after Dodger fans witnessed the meteoric rise of Yasiel Puig last year. Though Guerrero is four years older than Puig, it is important to realize that he still has never faced an inning of big league pitching. It really should be expected that Guerrero get some minor league seasoning before landing on the big club, but we'll see how he adjust in spring training. On Martin Luther King Day, back in January, 2011, I made the following post. It remains as appropriate on this same day three years later. * 9 years before the Supreme Court outlawed “separate but equal” laws with the Brown vs. Board of Education ruling. * 11 years before the Rosa Parks incident when she was arrested for refusing to move to the back of a bus. * 12 years before the “Little Rock nine” were accompanied by federal troops to attend Central High School in Little Rock, Arkansas. * 18 years before the famous March on Washington and Martin Luther King Junior’s speech in front of the Lincoln Memorial. That was true pioneering by Jackie. What a courageous and great man. I'll never forget my 6th grade teacher breaking down and crying upon hearing from us that Jackie Robinson had passed away on an October morning, 1972. Even after Jackie broke the color barrier, allowing baseball to integrate, there was a lot that needed to be accomplished in the civil rights movement. 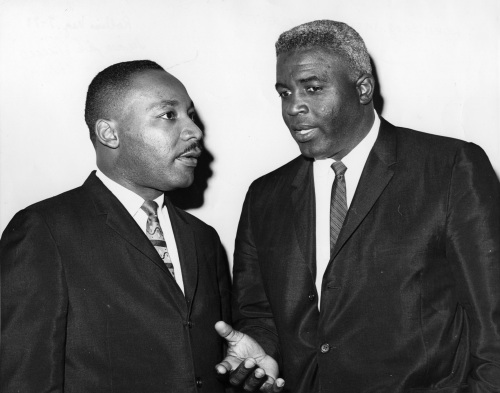 But the ice breaker was Jackie and Dr. King’s statement to Don Newcombe was significant. It would be accurate to say that the legacy of Jack Roosevelt Robinson will live on for ages. It set the standard and opened the eyes of the American public to be accepting of all races in sport. From there, the Civil Rights movement went forward. Have the visa issues with Alexander Guerrero been resolved yet? With all the money the Dodgers are spending on player payroll, don't you think they could shell out $200-250 grand to put a top notch immigration attorney on staff to ensure that all the foreign players, (i.e. Alexander Guerrero), have their documents in order? I find it incomprehensible that the organization has not done so and that there are delays in Guerrero's legal working permit. The procedures are a bit cumbersome, so certainly the Guggenheim group can afford to shell out money to ensure that all of their foreign players documents are in order. There's simply too much money on the line to have a key signee waiting for U.S. Citizenship and Immigration Services and their bureaucratic web to approve working permits. It'll be interesting to see if rumors are true and the Chicago Cubs or New York Yankees are willing to outbid the Dodgers for Tanaka. There is a number that the Dodgers have to consider too excessive for Tanaka. The question is if the Cubs or Yanks will surpass it? Also, is Tanaka's desire to live on the West Coast strong enough to allow him to take a lessor offer from Los Angeles in order to keep his wife happy? We have read the rumors about his wife and her desire to take up acting in Los Angeles. Hopefully there's some truth to those rumors. Ellis asked for $4.6 million and the Dodgers countered with $3 million. Jansen asked for $5.05 million and the Dodgers countered with $3.5 million. 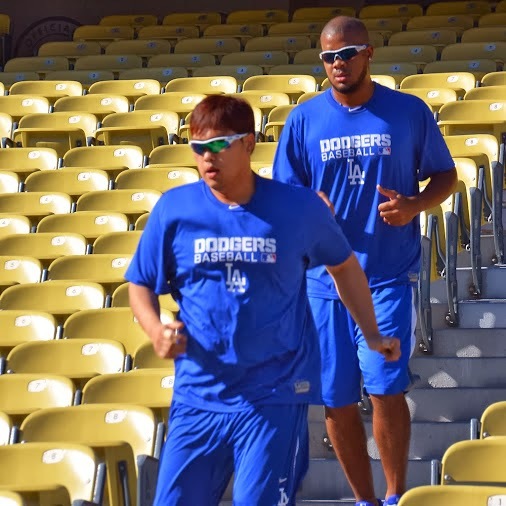 Ryu and Jansen work out at Dodger Stadium on Friday. Jan. 17th. Midpoints would be $3.8 for Ellis and $4.27 for Jansen. Both the midpoint figures sound about right and the Dodgers certainly don't want to create hard feelings and go to their first arbitration hearing since Joe Beimel in 2007. There are a few weeks to iron things out as arbitration settlements will be scheduled starting February 1st. Then again, if the Dodgers want to play hardball, they could conceivably win in the A.J. Ellis situation as he's asking for twice his 2013 salary and after having what most would consider a lackluster season. For a team with gobs of money, it's seems rather trivial to fight over a few hundred thousand dollars, but we'll see. All this whining about the Dodger ownership paying and paying and how things are unfair with the salary structure in MLB reeks of hypocrisy. Where were those whiners when McCourt was allowing the Dodgers to let the payroll sink even lower than division foe San Francisco and National League opponents like the Mets, Braves, Cardinals and Cubs? There wasn't much complaint about the Dodger payroll then. Nevertheless, the criticism will continue from those jealous fans of Dodger opponents who only wish they had ownership with 1/2 the commitment of the Guggenheim partners. If you thought things were bad after the Kershaw contract was announced, just wait until you see the backlash of they sign Tanaka. After Tanaka, there's one more thing for ownership to accomplish and that's signing Hanley Ramirez beyond 2014. It should be done before spring training. Back in the Saddle Again…Thoughts on "The Signing"
Yes, I'm back in the saddle, but not as literally as my 24 year old son, who is attending the Frank Garza Jockey School in Somis, CA, to see if he can cut it as a racing equestrian. That'll be another post for another day. Though Dodgers Chairman Mark Walter was quoted last year saying that “pitchers break,” there seems to be some confidence from the ownership group that Kershaw won’t be one of those guys. This is a risk. There’s no doubt about it. He’s going to turn 26 this year and he’s never suffered an arm injury. He pitches deep into games and throws a lot of pitches in the course of a season, maybe the most of any pitcher in the game.He even was called upon to pitch on short rest in the post season. All the signs are there that he could suffer a major arm injury. And there’s also a history of some plantar fasciitis with him as well. BUT...this signing had to be done. First, because he’s a Dodger. He’s a full fledged home grown Dodger and could you imagine the turmoil to the organization if he walked in his free agent year? Kershaw is a Dodger in the mold of Koufax, Drysdale, Garvey, Cey, Valenzuela, Piazza and Hershiser. Some of those guys left the organization and we all had regrets about it. This kid is on his way to the Hall of Fame, and heaven knows how long it has been since we’ve had one of those. This signing had to be done because he’s the best pitcher in baseball right now. Better than Verlander and Scherzer. Better than Bumgarner and Cain. Better than Sabathia, Lester, Darvish and Bucholz. Kershaw is the premier of premier pitchers. Good organizations don’t let such players walk away when they’re in their mid-twenties. No matter how much money he costs. This signing had to be done because the fan backlash to his departure would have been devastating. Just as the club has made in-roads at regaining that base from the disastrous previous ownership, they were able to re-sign their most important player. It doesn’t matter than he’s not a position player, Kershaw is the face of the franchise. This signing had to be done because not only is Kershaw the best pitcher in baseball, he’s the best citizen in baseball too. How many multi-millionaires fly off to the bush of Zambia each winter and build schools and housing for orphans? How many players live up to the Christian ethics that they espouse? 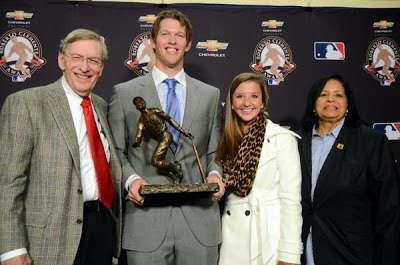 He's an exceptional teammate and also the youngest recipient of the Roberto Clemente Award. There’s next to no chance that he would ever go off and do something to embarrass the organization. As a representative of the L.A. Dodgers, there’s nobody else you’d want to pick. This signing had to be done because the "pros" out-weigh the "cons." It’s a lot of money, but it’s money well spent. 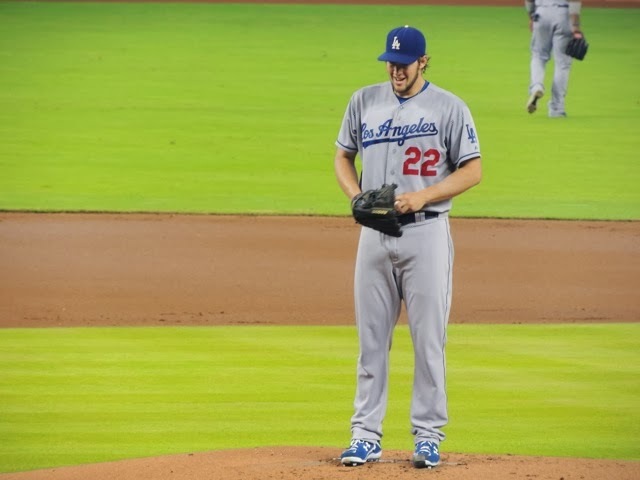 Seven years from now, (and I truly believe it will be seven and not after his “opt-out” fifth year), the Dodgers will have another tough decision to make regarding Kershaw, and it’ll be whether he's signed to another contract to ensure that this Hal of Famer retires as a Dodger. It will de a difficult decision, but one that is several years down the road and hopefully after the franchise has added two or three World Series trophies to their cabinet. Meanwhile, it’s time to enjoy the fruits of having the best pitcher in baseball through the 2020 season. Not a lot of organizations have the luxury of putting a “W” on the mound every fifth day. The Dodgers are practically assured of that now for the next seven seasons and that is worth $215 million dollars to the organization. About a week ago, I reported that the Left Field Pavilion would be opened up to the remainder of the Stadium. I received word over the weekend that my information was probably wrong and today, John Weisman's report at Dodger Insider (LINKED HERE), included a fairly detailed interview Dodger Senior Vice President of Planning and Development, Janet Marie Smith. She gave a clear explanation of the construction beyond the pavilions. I was completely wrong, the Left and Right Pavilions will continue to be segregated from the remainder of the Stadium. Bullpen overhangs are being built with graded seating from the Field Level. There will be a lot of concourse walking space and concessions. To the rear of the Pavilions will be restaurants, team gift shops and seating areas with the Right Field side having a Tommy Lasorda themed Italian restaurant. The Don Mattingly contract extension is the first of a trio that the Dodgers need to complete this off season, (Clayton Kershaw and Hanley Ramirez need to be extended too). It was also the least important of the three, BUT, it had to be done and I’m glad at least one of them is in the process of being completed. 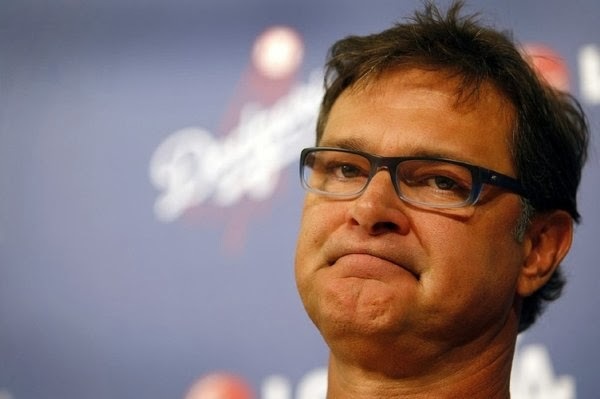 At his season ending press conference, in an awkward setting Mattingly expressed his frustration of being on a short leash this past season because of his lame duck status with his contract. If working under a three year contract umbrella will give him that comfort of not looking over his shoulder constantly, then it’s for the best. I think it’s well understood that Mattingly feels much more comfortable in the dugout knowing that his financial status isn’t on the line everyday. I could argue regarding Donnie’s faults as a field general, which are well chronicled, but I think it’s fair to say that he’s not the type of manager that is going to cost his club a lot of games during the season. He manages in the traditional fashion which is fairly predictable. There’s too much little ball for my taste, but there simply are not a lot of sabermetric types out there in the managing circles for the hiring. Baseball still operates a lot on reputation and within a network of well known people in baseball circles. Don Mattingly was a superstar player and viewed as a cerebral one at that. That pedigree kept him from toiling in the minors to pay his dues. His tutelage was at the side of Joe Torre, first with the Yankees and then with the Dodgers. He wasn’t earning his stripes in the minors, where he could have learned game management away from the spotlight. Mattingly had the pedigree that allowed him to bypass that step. In retrospect, it was probably a mistake but it’s safe to say now that Donnie got a pass from working in the minor league trenches. About a year an a half ago I had an interesting conversation with Ron Cervenka of ThinkBlueLA.com. Ron is quite passionate about following the Dodgers minor leagues, especially the High A Rancho Cucamonga Quakes. The topic we were discussing was the time the minor league staffs put in for such horrible pay. You’d think that in organized baseball, where some coaches have worked for the Dodger organization for years that some of these valuable managers would be compensated appropriately. The truth is though, those guys make peanuts. There are men that have paid their dues on the minor league levels, but seem to never rise into the foray of consideration when major league jobs surface. Think about it. You’ve got a guy like John Shoemaker in the Dodger organization for years. He has been labeled as a man that works well with kids in the minor league levels, essentially pigeon holing him into a lifetime of minor league managing at the lower levels. I don’t think it’s fair to Shoemaker, but he has been labeled. I also think if given the opportunity, he’d be a great major league manager. Stan Wasiak was a dedicated Dodger employee 47 years. An infielder signee with Brooklyn in 1940 as a teenager, he never advanced beyond AA ball as a player but the organization saw him as a knowledgeable baseball man. He was an excellent teacher of the fundamentals to kids. He started managing at age 30 in 1950 and he continued as a minor manager until his 65th birthday in 1986. Valdosta, Newport News, Mobile, Idaho Falls, Green Bay, Great Falls, Salem, Lynchburg. Evansville, El Paso, Daytona, Albuquerque, Lodi, and Vero Beach were some of his stops. He compiled a .520 winning percentage over 18 different cities in 37 seasons for a total of 5496 games. Never once did he even sniff an opportunity at the majors and it wasn’t because he didn’t want to advance. Wasiak actually was hopeful to make the major league staff in the early 70s with the Dodgers, but it never materialized. That didn’t get Stan any closer to the majors though. After managing AAA Albuquerque to a few sub .500 finishes in the mid 70s, the Dodger organization felt that he was best suited to teach younger kids as players closer the the major league level weren’t going to listen to him as the younger kids would. Back to Lodi in the California League he went. It is estimated that Wasiak traveled in the neighborhood of 3 million miles on buses all over North America with his teams, and he never made anything near $30,000 a year doing it. And this leads me to another beef I have with the game. and that is the poor compensation that so many managers and coaches in the minor leagues receive. It isn’t uncommon to see a minor league manager making in the neighborhood of only $30,000 or $40,000 a year. These are guys that put in long hours and ride the buses in the bushes for months at a time. Added to that is that they are not only managing teams, but serving as parents, impromptu counselors, roster decision makers and are stuck with the unenviable task of giving the news to players that will be faced with the realization that their playing careers are over. It isn’t uncommon that in some lower levels these guys are acting as traveling secretaries, and even grounds crew. Add to that the daily field reports sent to the parent club and scouting they will complete of their league in general. After Spring training ends, most leagues are as long as 144 games, and then there are playoff series as well. On the lowest levels, the travel can be brutally tough, with uncomfortable bus rides and subpar hotels. So when you head out to Camelback Ranch and meander over to the minor league fields, if you get a chance, let these men know that they are appreciated. You’ll see them in action, working drill after drill with the young kids and stopping to provide detailed instructions to them. These men are a special breed of baseball men. They aren’t there for the pay, but for the love of the game. They’re the unforgotten heroes in the trenches. Minor league managers and coaches that groom ballplayers into major leaguers. It’s not an easy job. A thankless one for the most part. They should be recognized. 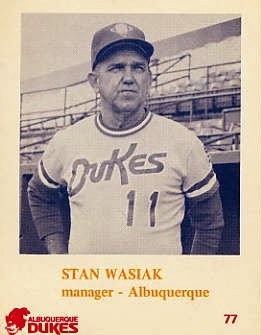 (*Note: Stan Wasiak retired from baseball at age 66 following the 1986 season managing Vero Beach. He passed away six years later at his Mobile, Alabama home having never stepped in a major league field, except to throw out the ceremonial first pitch after breaking the minor league record for managerial victories). The Blog Will Be Inactive For a Few Weeks (explanation below)…But Don't Worry, "Dodgers Insider" Debuts on January 6th! As we roll in this new year we are about to be introduced to the Dodger blog of all Blogs on Monday as the newest Dodger hire, Jon Weisman (of DodgerThoughts.com), takes his talent to the organization as Director of Digital and Print Content. This is an exciting move that is sure to bring all of us Dodger fans and Dodger blog followers many, many hours of enjoyment. I can only imagine the product that Jon will put out now that he’ll have complete and full access to the Dodger clubhouse being within the organizational structure. They couldn’t have found a more worthy hire. Jon is not only a great writer with decades of experience, but he’s innovative and cutting edge. Jon Weisman is the man that started the Dodger blogging craze and as the pioneer, he has never waivered at providing us with the best material out there. Even when he went on hiatus for a little while, the stuff he would post was still of top quality. If you haven’t purchased Jon’s 100 Things Dodger Fans Should Know and Do Before They Die, go to THIS LINK and order the book now. It’s winter time for heaven’s sake. You know you have plenty of time to read it, and you won’t be able to put it down once you do, so it’s an easy one-day read. I have no doubt that Jon Weisman will bring ideas to the Dodgers that will make their monthly magazine, social media, and blog so professional that they’ll be the envy of the rest of major league baseball. If you really think about it. Jon’s position may be one of the most important in the organization when it comes to the Dodgers marketing the club and bringing in future generations of fans. I know that winning plays a big role in that, but twitter, facebook, blogs, electric, social and print media...they are the sources that we will seek out. Who better to select for the job than a man that not only knows the club and its history, (and we can’t forget that Dodger historian Mark Langill will be working with him), but he’s an award winning writer. Then we can add that he’s a proponent of the modern way to look at the game through saber metrics. Heck, he educated a lot of us on that. Seriously I think the we are going to see some great stuff come out and perhaps fans will be educated little by little in the nuances of the modern game. I think one of the great things about DodgerThoughts.com was that a lot of us were educated by Jon, who would discuss Bill James’ theories and such. What followed were great posts from his readers and an onslaught of “Dodger Thought” that was not only very intelligent, but thought provoking as well. I know that it changed my way of thinking about the game. So many off-shoots have since created blogs and we owe all of that to Jon. He fomented the movement. With that said, speaking of Dodger blogs, and this one in particular. I must announce that I will be on a work assignment in Washington, D.C. after this weekend that will seriously hamper my ability to post new material to this site for about two weeks. From what I know so far, I will have virtually no spare time to write anything “Dodger related” for those 15-16 days or so. I'll be writing, but it won't be about baseball, and it won't be for public consumption either. 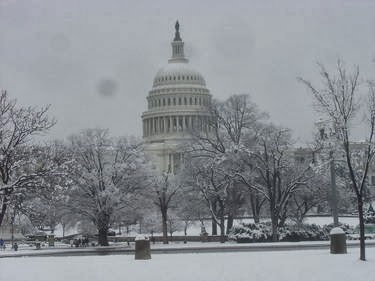 Leaving for DC on Sunday night, 50% chance of snow, 11 degrees is the forecast. Getting cold just thinking about it. This is the first “sabbatical” I have been forced to take since starting Opinion of Kingman’s Performance, so I just wanted to get that information out there to those faithful followers that I’m not going away...at least not permanently. I should be back in action by the weekend of January 18th. By then I will have returned to California and should be completely thawed out. Meanwhile, check out the blogroll on this site and read Dodger updates from other bloggers and don’t forget the debut of “Dodger Insider” over at the Dodgers MLB website on Monday, January 6th. That place is going to be the best source of information for years to come. The rest of us? Well, you can stop in and check on out opinions and tidbits for some entertainment. Or maybe a chuckle every now and then. Oh, and congratulations Jon on your "dream job." It certainly is well deserved. Thank you for supporting this site over the years with that occasional link over at DodgerThoughts too.